Location: Prominently sited on the west side of the road junction between the main A466, Devauden Road and Fordwich Close. Set into the tarmac with a circular stone border. Erected in 1893 following a decision by Monmouthshire County Council to erect fountains at a cost of £5 to £7. St. Arvans was able to afford a much grander public fountain costing £30 because of additional funds being made available locally. It was manufactured by the Sun Foundry, Glasgow, the Iron Stores Company, Chepstow and Monmouthshire County Council. The Glasgow foundry providing the decorative work, the mechanical element coming from Chepstow and the stone base built by the local authority. 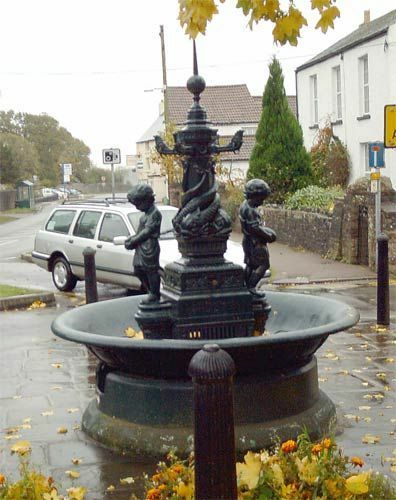 Originally the fountain was located on the opposite corner between Devauden Road and the A 466, and was moved across to its present position in the early 1930s when the road junction was redesigned; the water supply was disconnected at this time. Fine painted cast-iron fountain on a circular stone base. Broad circular bowl with ribbed detail. To the centre is a square fountain unit with slits to base; stamped The Iron Store Company Chepstow. Above is an octagonal stem entwined with four fish and with brackets and a ball and spike finial to the top; all out of the Sun Foundry catalogue. The brackets have hooks on them for hanging water pails. To the north and south, set on projecting plinths, are figures of children with upturned ewers. The base has a drain to the north. Listed as a fine, and prominently sited, Victorian public fountain. Located at the junction of the A466 and the Devauden Road. In the centre of St. Arvans village on the east side of Devauden Road opposite to the junction with Grange Road. On the east side of the A466 about 150m south of St Arvans Lodge. In the centre of St. Arvans village approached from the Devauden road by both Church Lane and Grange Road. About 50m south west of the Church of St Arvan. At the north end of Piercefield Park giving access to the A466 and the walks on the Wyndcliff. At the north end of the village, set in the slope at the side of the road and almost opposite Bwythyn y Ffynnon. Set into the west boundary wall of Chepstow Racecourse (Piercefield Park) about 1200m north of the junction of the A466 and the B4293.